In this extensive and well-written book, Sam Wright looks back on his experiences as an aviator during the eventful years of the 1940s. 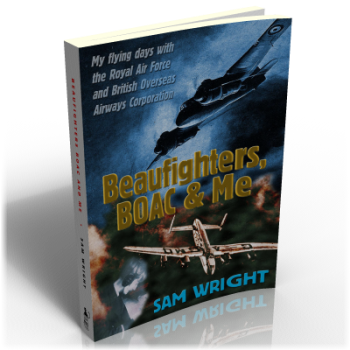 As a navigator with 254 Squadron, flying from RAF North Coates, Sam and his pilot formed the 2-man crew of a Beaufighter. As part of a ‘Strike Wing’ their role was to attack enemy shipping in the North Sea, dropping torpedoes or bombs and strafing with the Beau’s formidable firepower. Sam does well to capture the heady mix of thrills and anxieties involved in flying in the plane the Japanese later nicknamed ‘Whispering Death’. In 1946 Sam was seconded to BOAC, flying Avro York and Lancastrian aircraft on some of its earliest operational passenger routes to Egypt and India. His recollections of this bygone era of civilian flying also make for fascinating reading.